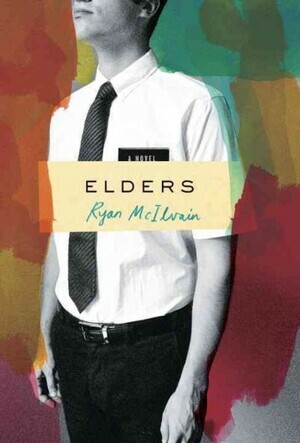 Ryan McIlvain’s Mormon missionary novel Elders (Hogarth, 2013) is set in the Brazil Belo Horizonte West Mission in early 2003. I served in the Brazil Belo Horizonte East Mission between 1999 and 2001. Like McIlvain’s missionaries, I spent many long days “hitting doors” and climbing hills to teach people whose interest in our message rarely matched our determination to share it–even when our determination was perceptibly lacking. Also, for more than half of that time, I found myself in situations much like what we find in the novel: a companionship comprised of one American missionary, one Brazilian missionary, and a trunkful of cross-cultural baggage. I don’t know if any of this makes me an ideal reviewer for Elders. At times, reading the novel felt like time traveling. Once again, I was on the steep streets of Minas Gerais, nursing a grudge against a companion who was himself nursing a grudge against me. The palpable silence. The terse deliberations. The resentful longing for a new companion. McIlvain, a returned missionary himself, captures these realities of missionary life with an accuracy of which only the initiated are capable. His missionaries, Elder McLeod and Elder Passos, are a mismatched pair. McLeod, the junior companion, is the brash, fortunate son of a Boston bishop (think: Mitt Romney in the ’80s). Passos, the senior, is an ambitious convert from the favelas. Both have their admirable qualities: McLeod is earnest, if not successful, in his desire to seek Truth and acquire belief, while Passos works hard and cares deeply about his family. Still, they can’t seem to get along. McLeod’s doubt and immaturity grate on Passos, and Passos penchant for self-righteous posturing and mission politicking annoys McLeod. I don’t necessarily identify with either McLeod or Passos, but I can certainly relate to the tension. I know few returned missionaries who cannot. The plot of Elders is as follows: Elders Passos and McLeod, while different and incompatible, make an effort to work together when they meet a couple–Leandro and Josefina–who show real interest in their message. However–and this is where the novel breaks form slightly–their effort becomes strained when a major South American soccer championship and the US invasion of Iraq disrupt their momentum and throw their cultural differences into sharp relief. By the novel’s midpoint, McIlvain is juggling not only the usual conflicts between the mismatched elders (obedience vs. disobedience, belief vs. doubt, etc. ), but also questions about American imperialism and religious colonialism. These questions, to be sure, are not always well-defined. For instance, both Elder McLeod and the mission president–a pale, round-faced capitalist–are figures of everything intrusive about America’s Bush-era foreign policy, yet neither evokes the cowboy abandon we have come to associate with it. The mission president, for instance, is standard GA fare–affluent, managerial, bland–but he seems more a stand-in for a patriarchal Mormon bureaucracy than an American imperial presence. If anything, he plays the imperialist only by default–by being nothing more than an American in a position of authority in a land that is not his own. McLeod, on the other hand, comes closer to the ugly American stereotype–especially in one tragic scene where he does his negotiations with fists. Still, the metaphor is strained–especially since McLeod is supposed to be an intellectual figure, an iconoclast who at the end of the novel is in the process of scraping away the scales of ideology. Nowhere in the novel does McLeod ever express ardent support for the Iraq invasion or betray any intense patriotism. Brazil and Iraq, in many ways, seem inconsequential to his journey–superficial catalysts in his coming-of-age. For me, this is a missed opportunity. In my criticism of other missionary novels–specifically Coke Newell’s On the Road to Heaven­–I have noted that these novels often portray anti-Americanism without exploring and contextualizing it. In Elders, McIlvain sets the stage for this cultural work, but ultimately fails to deliver. For instance, Elder Passos and a member of the ward in which the elders serve frequently use McLeod as a scapegoat for their outrage over the invasion, yet the novel never penetrates the surface of their words. In a sense, we hear that they are angry about the invasion and blame McLeod for it, but we don’t know why. What is the source of their resentment? Why do they feel and express it so vehemently? Why do they single out McLeod–their friend–and attack him so viciously? The lack of insight into these emotions leaves the novel’s critique of American (and Mormon) imperialism a bit routine. I’m still looking for the Mormon missionary novel that adequately addresses the ethics of missionary work from a postcolonial/post-imperial context. However, as a novel, Elders ultimately disappoints in the way that the story is at once so familiar and so foreign to me. As I mention above, the novel takes place near the place and time I served my own mission, and so much of it rings true to my memory of Brazil and its people. At the same time, what I find missing in this novel is the spiritual earnestness that I felt as a missionary and witnessed in the lives of other missionaries and other people with whom I served. I understand, of course, that Elders is not about spiritual earnestness, but the lack thereof. Still, a cynicism towards that earnestness pervades the novel in a way that casts Mormonism–and maybe religion in general–rather facilely as a kind of game people play. It is a gospel that “works” because it makes people happy–regardless of their level of actual belief. Characters uniformly embrace it not because of earnest belief, but because of what it can do for them–a means to an end. Maybe that is what Mormonism is for some people (McIlvain’s characters will certainly not be unrecognizable to Mormons), but it hardly accounts for the Latter-day Saints whose belief in and commitment to Mormonism exist in tandem with the complexities of doubts and uncertainties that make Mormon life–real Mormon life–something much richer and ultimately more interesting for Mormon and non-Mormon readers alike. This kind of portrait of Mormonism is hard to write, of course, but many Mormon writers have succeeded in doing so–particularly Douglas Thayer (The Conversion of Jeff Williams, The Tree House), Angela Hallstrom (Bound on Earth), and Brady Udall (The Lonely Polygamist). In later efforts, perhaps, McIlvain will give earnest Mormon belief–and doubt–the complexity they deserve. Intriguing review, Scott. I’ll have to read the book sometime, although I have other Mo-themed worked which I’ll probably hit first. I’d be curious about your opinion of “Fires of the Mind” by Robert Elliott in the Saints on Stage anthology. I think that is my favorite missionary themed story. I find Ryan’s work frustrating and although I probably will read this sometime (not that he feels a similar Fob-family obligation about my novel), I can’t come into it expecting anything other than what you’ve just said.